ii, 10 p. : ill. ; 23 cm. By A.C. Morgan and D.C. Parman. BUREAU OF ENTOMOLOGY CIRCULAR No. 173. AGAIN-T TIlE :' TOBlACCO liOIRN\OI!MS. C. L. MARLATT, Entomologist and Acting Chief in Abscnce of Chief. F. H. CHITTENDEN, in chargeof truck crop and stored product insect investigations. A. L. QUAINTANCE, in charge of deciduous fruit insect inrestigotions. SOUTHERN FIELD CROP INSECT INVESTIGATION. W. D. HUNTER, in charge. W. D. PIERCE, J. D. MITCHELL, G. D. SMITH, E. A. MCGREGOR. HA&RY PINKuS. B. R. COAD, W. A. THOMAS, R. W. MORELAND, A. W. JOBBINS-POMEBOY, C. E.
HESTER, engaged in cotton-boll wceril investigations. T. E. HOLLOWAY, E. R. BARBER, engaged in sugar-lane insect investigations. J. L. WEBB, engaged in rice insect inreslioations. R. A. COOLEY, D. LI. VAN DINE, A. F. CONRADI, C. C. KBUMBHAAI, collaborators. L. 0. HOWARD, Entomologimt and Chief of Bureau. director of the Tennessee Agricultural Experiment Station. of arsenate of lead if it be compared with this well-known poison. 2 ARSENATE OF LEAD AGAINST TOBACCO HOBNWORMS. NECESSITY AND ADVANTAGES OF THE USE OF AN INSECTICIDE. greatly in favor of an insecticide as compared with hand-picking. more than $2 or $3 an acre-sometimes less. THE USE OF PARIS GREEN. due to damaged tobacco, is much less than the cost of hand-worming. Paris green is applied with a dust gun and without a carrier. begin to increase inii i1iifivC. aflcr the tirvt application. OBJFtI. 'iuI TO il USE OF PARIS 1,I-.l.N. preventive of irritatlioii. particularly if followed by a bath. INJUTRY Y PABIS UKREU TO TOBACCO. dews immedictkelv fi11h,\ in,, an application will wash the Paris grer..
ih-. and serious injury is likely to result. profit, and that many other growers suffered a similar loss in 191-2. 4 ARSF.NATE OF LEAD AGAINST TOBACCO HORNWORMS. extremely careful in making applications. condition, however, he did not believe the crop was worth over 5. 5 cents-a gross loss of 21 cents per pound, or about $20 per acre. or become so weakened that they drop off when the plant is cut. THE USE OF ARSENATE OF LEAD. green can not be applied to tobacco in the "graining" stage (i. e..
the other hand, can be safely applied to tobacco in the "graining"
ARSENATI. UFi. LEADl AUAlNbi ll lt Lii ti1lINW M..
noticel Iilt. injurioulls t'tl' s u pol) the o elrniatiors. ator's standpoint, its insecticidal properties should next be disc.smJd. of lead and 4 'ur.i, y i n in fair wt .ftir'r. I AUg *NS 1010 5 .> Lefad iuwnen W 1I34 1 0 I 46 |W 24 -;I .i '; '"
r Twern fD -TO pluaiun di nd urinary hild-worming. cation numerous small worms were noticed in woring 200 plants. to heavy dews which tended to puddle it. and to heavy drx ing wind. during the day, which blew some of it from the plants. 6 ARSENATE OF LEAD AGAINST TOBACCO HORNWOBMS. minent No. 4, but 52 in experiment No. 5.
full grown and lapped in the rows considerably. arsenate of lead and Puris green in rainy weather. application. applied. dav day 'lay worms left. I Aug! 2 1911 5 Lead arsenae. 59 49 15 41 10 I 2 Small. The three experiments recorded in Table II are very interesting. quired. KIprriinent No. 2. 4 iiiil- of arentate (f lead per acreo. r'ii gi-reen plat. I'ortunately for the itl I upon thle t4dobacco 13.t-. 2 Pounds per acre. ioits were ti3 O h15 31 [i.. in AIhn nr, ilntace. pounds per arei. 1'ouits were TIIiiId on 5"i hillk in each instance. aplpliration. Fa\oralble weather pri-vailed after both anjilintiin. thoroughly with an equal weight of ituely sIftled air-slaked liiii,. ARSK.NATK .11' I 'I \I ",1 li'll i n l111 H! \' "i M .
ARSF.NAI1E OF LEAD AGAINST TOBACCO HORNWOBMS. rained upon immediately following the application. HOW TO APPLY ARSENATE OF LEAD TO TOBACCO. wood ashes. At least an equal bulk of the wood ashes should be used. be obtained unless the application is made with a powerful dust gun. results. Avoid these mistakes, and satisfactory results will be secured. Thoroughness of application can not be too strongly recommended. l1 41 NM\I t(M'' 4. Arsena(es of lead. theoretically, are either triplumbic or ,lip lumibi,. satisfactory in.M'cti.idail results when used ia irist this insect. WHEN TO APPLY ARSENATE OF LEAD. DOSAGE OF ARSENATE OF LEAD REQlIREI). application of .' pounds of arsenate of lead per acre will be efficient. Full-grown tobacco should receive not less than 5 pounds per acre. 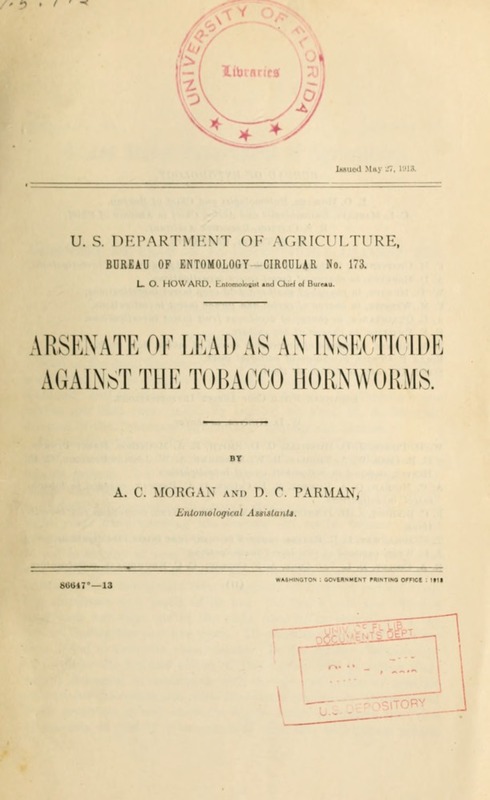 ARSENATE OF LEAD AGAINST'r TOBACCO HORNWORMS. COST OF ARSNATE OF LEAD. should more than compensate for the extra cost of this insecticide. from 1 to 2 pounds per acre. Paris green is dangerous and ineffective. hornworms, and that it be applied as a dust or powder. to 4 pounds in 100 gallons of water. wood ashes, used in a bulk at least equal to the arsenate of lead. of at least 8 inches. WASHINGTON, D. C., Ft l1,i,'!/ 6. 1913.